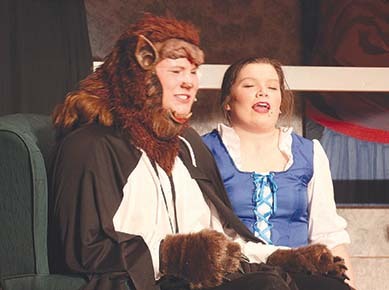 The production, from the book by Linda Wolverton, features music by Alan Menken, and lyrics by Howard Ashman and Tim Rice.Boone Central students presented their spring musical “Beauty and the Beast,” to appreciative crowds last Friday, Saturday and Sunday, March 23-25. In these scenes (top) The Beast (Trey Zoucha) interacts with the heroine Belle (Stephanie Wright); and (lower photo) Lumiere (Scott Wright) and Babette (Julia Spann) close out their celebration dance. More photos on page 14. Over 50 students were in the cast and crew of “Beauty and the Beast” presented by Boone Central High School last Friday, Saturday and Sunday. Michele Wright, vocal music director, was assisted by Jacque Dickey with direction and costumes. Whitney Jones, instrumental director, led the orchestra, with Jill Nore as pianist. More than 600 attended the three performances of the musical in the performance gym, which now has much-improved acoustics. See all photos and story in the March 21 Albion News & Petersburg Press, Print and E-Editions.